Among the options to configure for securing information on your Samsung Galaxy S5 include Encryption, Passwords, Device Administration, Security Update Service, and Credential Storage. Read on to learn how to manage each of these options on the phone settings, so as to enhance your phone's security feature, anytime and anywhere you go. 1. Tap on Apps from the Home screen to begin with. 3. Tap on the Security icon. Encrypt device - To get started, tap on Set screen lock type and then follow the on-screen prompts to complete the entire information encryption procedure. Encrypt external SD card - Tap on Set screen lock type to begin with, and then follow the on-screen prompts to encrypt information on a preferred memory card installed on the phone. To avoid any issues when performing encryption, be sure to have your phone battery charged to at least 80%. Otherwise, it would be better to plug your phone into the power source and leave it charging during the encryption process. 1. Tap on Apps from the Home screen, to get started. 2. Select Settings to continue. 4. Tap to check the box next to Make passwords visible. Doing so will enable the setting. Tap on the same check box to disable it. There are some apps that would require you to allow access to your device through device administrators in certain circumstances, like when you lost your device or it is stolen. Setting the number of failed password attempts before the device is restored to default factory settings. Restoring the device's factory settings. 2. Tap Settings to continue. 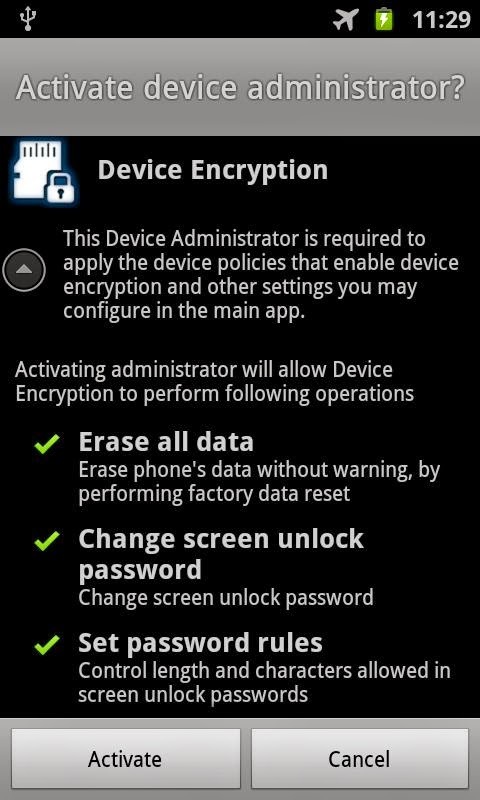 Device administrators - This option allows you to enable, view or disable device administrators on the phone. Under device administrators is the Android Device Manager option that lets you lock or erase a lost device. To get this done, you need to enable Android Device Manager. Unknown sources - This option will enable or disable your phone's ability to install apps from unknown sources other than Google Play Store. Just tap the check box to turn this option on or off. Verify apps - This option will enable or disable a warning before installing applications that may cause harm or some issues afterward. Tap the check box to turn this option on or off. 2. Tap to select Settings next. Security policy updates - When enabled, this option lets the phone automatically check for changes to the security policy and then download any updates available for better security and service. Perform the following steps to enable this option. a. Tap on the check box next to Automatic updates. Doing so will enable or disable automatic updating of the phone's security policy when connected to preferred networks. b. Tap Preferred networks, to choose an option for downloading security updates on the phone. c. Tap Check for updates, if you want to manually check for updates. Send security reports - When enabled, this option lets the phone only send security reports to Samsung when it is connected to a Wireless network. Storage type - This option lets you choose a storage type to store data in key-value pairs, in a private database, on the device memory or your own network server. Trusted credentials - Tap this option if you want to view credentials you have installed on your phone. Install from phone storage - Tap this option if you want to install encrypted certificates from an available memory card installed on the phone. Clear credentials - Tap this option if you want to clear or remove stored credentials and reset the password. This option is only available when credentials are installed on the device, though.